Recently I aquired a copy of the Official Wing Commander Hand book, the illustrated reference to the world of Wing Commander as it appeared in the movie. I've leafed through it several times and read several sections already. If you enjoyed the movie, I highly recommend buying this book. However, it also gave me a new idea of how to approach the layout for the ships. Previously, I could fit between one and two ship entries per page in a blocky layout. While this offered the information in a single glance, it seemed very static to me and didn't have the feel to it I'm looking for. 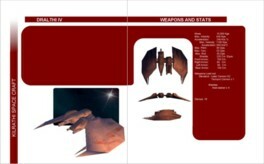 In the Confederation hand book, they covered the various ships in the Movie universe, including the Rapier and Dralthi. The Layout for the Rapier seemed more "Organic" to me and got my mind rolling. I have recently developed a new layout for the ships that incorporated a two page spread for each ship. Below is an example of the old layout, and the new layout. By clicking on either layout, you can see a full size version of that layout. However, they are fairly large images. You need to give them some time to load. 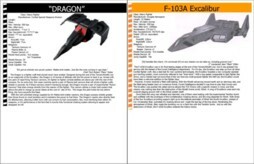 Like the Beta entries of the various fighters and capital ships already in the downloads section, there are now additional Beta pieces of the guide. The intro pages to the games section covering Wing Commander IV: The Price of Freedom and Wing Commander Kilrathi Saga. In truth, these pieces aren't even really beta. Pre-beta perhaps. I haven't even spell checked them at this point, however I decided to make them available for the purpose of getting feed back. I've also added a link to the Fan Guide's forum, that the CIC hosts. I'll be popping in there every few days and leaving messages about various things from my plans for the guide to asking for help or opinions on something. For anyone interested in pictures, I've re-organized the pictures section. I've also put up the various titles I've made for the guide. Just remember, there is no guarantee that these images will be the same ones used the final version of the guide. An example of these titles is below. On a final note, as I was in the past, I am always interested in help on this project. The sheer amount of information is a staggering thought, and it will be a very long time in coming with simply one person working on it. If you are interested in helping with this project, please contact me. I'm always interested in artists to draw characters, ships, and/or weapons and also people who are interested in writing sections on anything in the series, books, movie or TV show.